Ultrarunner Kenny McManus has added his name to the list of Hospice supporters who will put their heart and soul into fundraising on the last weekend on this month. 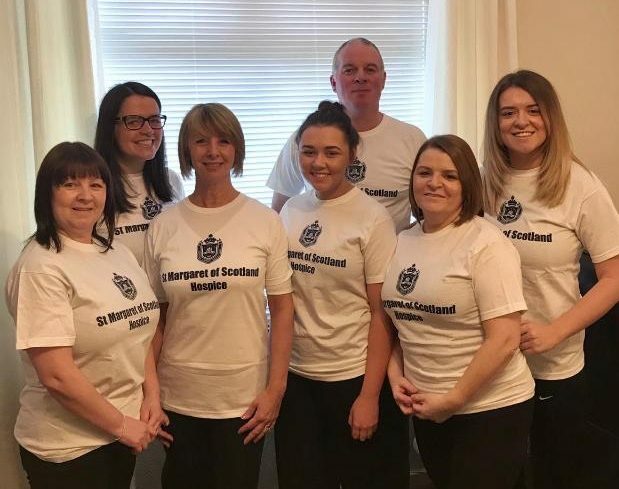 The dad, from Cumbernauld, is taking on the Highland Fling in tribute to the staff who cared for his gran – which means he’ll need to keep his fast feet going for 53 miles along the West Highland Way from Milngavie to Tyndrum. Also in action on 27 and 28 April are scores of Kiltwalkers and several marathon runners who, like Kenny, have spent the first few months of the year training for the arduous task they face. Kenny turns 37 on the day of the race (Saturday 27 April) but will put thoughts of celebration to the back of his mind as he approaches the start line at 6am. He knows the long and hilly road that lies in front of him will be the toughest physical test he has ever faced – but it’s a test he is looking forward to. “I’m doing this as a small thank you for the excellent care the Hospice provide. “I chose this event as because it’s located near me and it’s on one of Scotland’s best- known walks. It also appealed to me because it’s a massive challenge, even for the elite runners. “The goes over Conic Hill at Balmaha and has a 7500ft climb – so it isn’t a nice, flat run. His 16 weeks of preparation have included several very early starts and overcoming all sorts of extreme barriers, including running up hills in deep snow and taking on a shortened version of the Ultrarun – at just the 38 miles. Kenny, who works as a quality engineer, added: “Most training runs have taken place before 6.30am on cold, wet Scottish winter mornings. 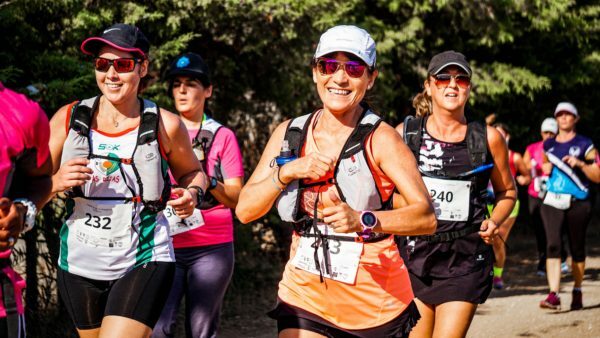 Endurance athletes often look for motivation in the same places – the sense of achievement at accomplishing such an amazing feat, and the prospect of feeling relief and reward at seeing the finish line and the faces of loved ones on the approach. Supermum Holly Shivas is running the London Marathon on 28 April with two big targets in mind. 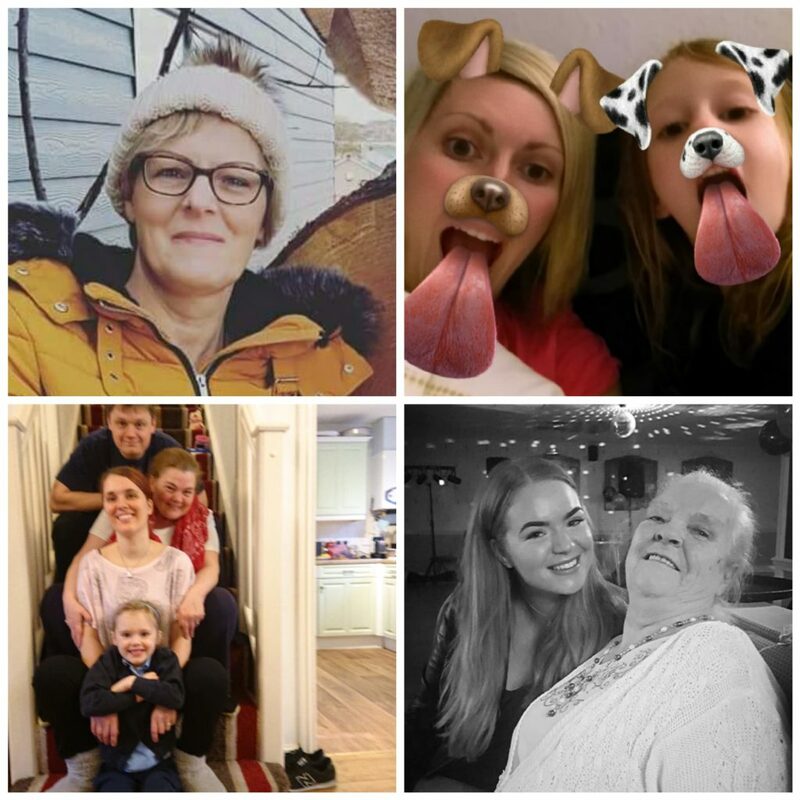 One is to raise as much funding as possible for St Margaret of Scotland Hospice in memory of her granny and grandpa – and she is already close to doubling her target total of £500. The other goal is one she shares with everyone who is taking part – crossing the finish line after months of gruelling training. Clocking up so many miles is all the more amazing given Holly, 31, has two small children, the youngest of whom is aged just one. We asked Holly, from Stewarton in Ayrshire, how her training has gone and why she chose to raise funds for the Hospice. “Prior to this, the furthest I had run was a 10k, which was 10 years ago. So it’s been very tough to get back into it. I started training just after Christmas and have found it difficult due to having two daughters, ages three and one. 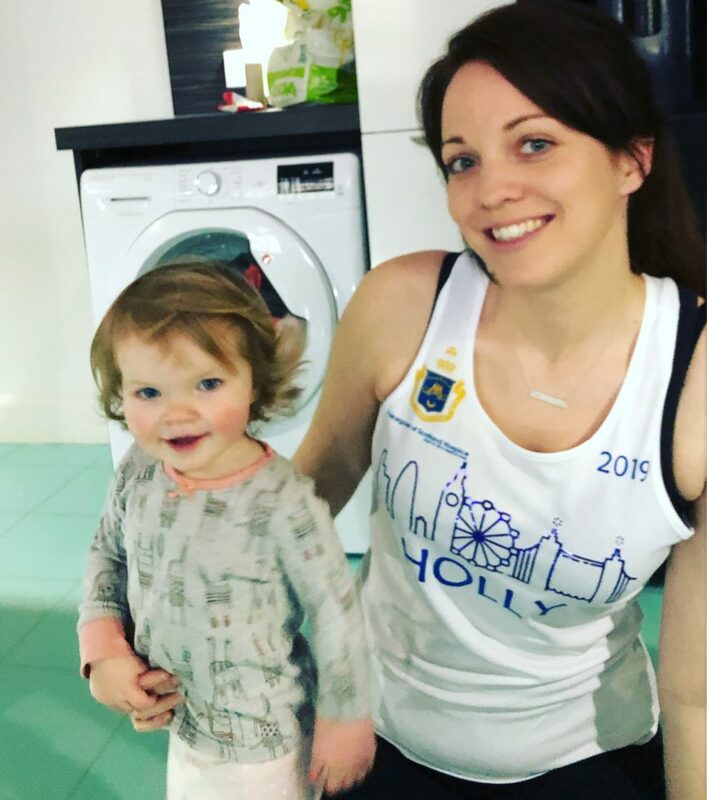 “I have loved the training with the exception of the time I have had to spend away from my children and am really excited to take part in the marathon now. I choose the London marathon because I love a challenge and I couldn’t think of anything more challenging to myself than running that distance. “I had signed up to do the marathon last year and deferred my place due to being pregnant. I didn’t have any charity in mind until I made the decision to give something back to the Hospice after seeing their great work. “I saw the amazing work the Hospice carried out when both my grandparents were there. My granny loved the care so much she stayed over a year! My grandpa got to share a room with my granny when he took unwell and, due to the amazing service offered at the Hospice, they were together again in my papa’s last days. 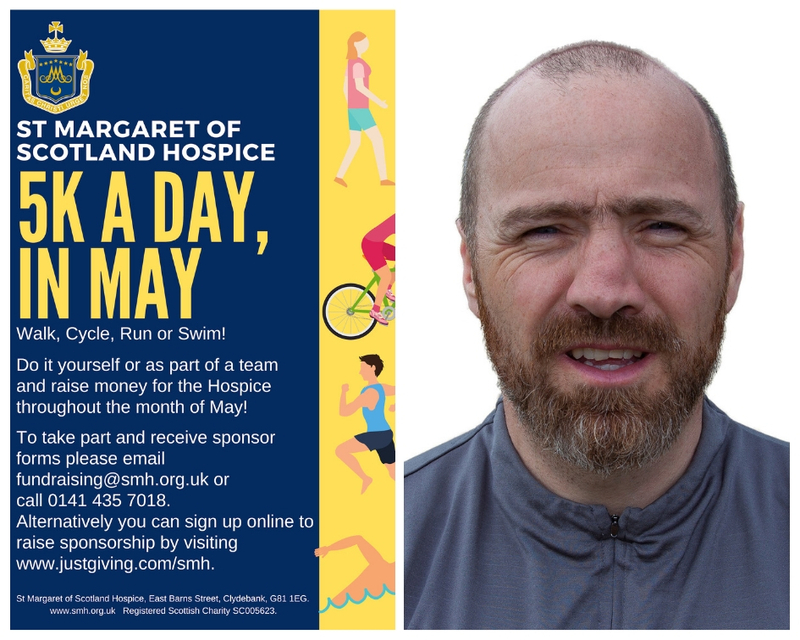 Greig Robertson has organised a fantastic new event to encourage people of all ages and abilities to get active and raise funds for the Hospice. 5K a Day in May invites you to walk, run, cycle or swim 5k in every day of the month, on your own or in a team made up of friends, family members, classmates or colleagues. Greig, an Under-18s coach at Celtic FC who lives in Duntocher, took part in a Q&A to us to tell us about why he organised the event and what it will involve. Why did you decide to organise this event? Greig: I always wanted to organise an event that would help raise some much-needed funds for the Hospice and as a keen runner I thought that this would be a perfect match. Tell us a bit about it – how can people take part? The idea is to try and cover 5k each day for the month of May by running, walking, cycling or swimming, as individuals or as a group. For example, five work colleagues might want to get involved in this event and each walk 1k each day during their lunch break. Primary school pupils could complete 5k a day as a class. Any looking for ideas or to get involved can contact the Hospice fundraising team on 0141 435 7018. Do you have any personal connection to the Hospice? My dad lost a short battle with cancer in December 2017 and spent his last few days in St Margaret of Scotland Hospice. I was touched by the warmth and empathy shown towards my dad and all the family whenever we were there. The work carried out by the staff is incredible and I made a commitment to myself shortly after the passing of my dad that I would do my very best to help and support the wonderful efforts of everyone associated with the Hospice. What has been the best thing about organising the event and fundraising? I visited a local primary school recently to invite them to take part in the event and the idea was so warmly received by the head teacher, which provided me with hope and encouragement that this event could be a success. What message would you like to send to people looking to take part? Please get involved in any way you can and let’s try and raise as much money as possible for this incredible cause. If people miss a day here and there then it isn’t going to be a failed challenge. Hopefully this can raise money but also possibly inspire you to make lifestyle changes. Three generations, eight members, four hometowns.. but just one great team. Maggie’s Walkers are one of the biggest groups among the 47 Kiltwalkers taking part in the event later this month who will raise funds for the Hospice. They will walk in memory of Margaret Tilbey, a beloved mum, gran and great-gran to various members of the team. Sisters Julie Murphy and Linda Gierasik are the elder stateswomen of the group, at 51 and 56 respectively, while the middle generation features 33-year-old Carolann and 31-year-old Gary Draycott, Angie Brown, 31, and Rachel Gierasik, 27. The youngest walkers – and those with the highest step count by virtue of their little strides – will be Lucy Draycott, six, and Mia Brown, eight. The Draycotts are from Dumbarton, while the Browns live in nearby Vale of Leven and Linda and Rachel are making their way to the event in Glasgow from Dundee. With the range of ages comes different levels of experience in endurance activities – but Julie, from Helensburgh, expects all of the walkers to enjoy an unforgettable day by drawing on their strength in numbers. She said: “We are really looking forward to doing this as a family, spending time together, getting fitter and raising money for a cause that is close to our hearts. With several weeks still to go, Maggie’s Walkers have already raised an incredible sum of almost £1300. But they are not done yet and have set a target of £1500 by the time the event comes around – although Julie says the family will “never repay” the staff at the Hospice for the care provided to Margaret. She explained: “Our Mum/Gran/Great-Granny was in the Hospice last year for the last few weeks of her life. Brothers Scott and Grant McFarlane and banding together to run the London Marathon next month. 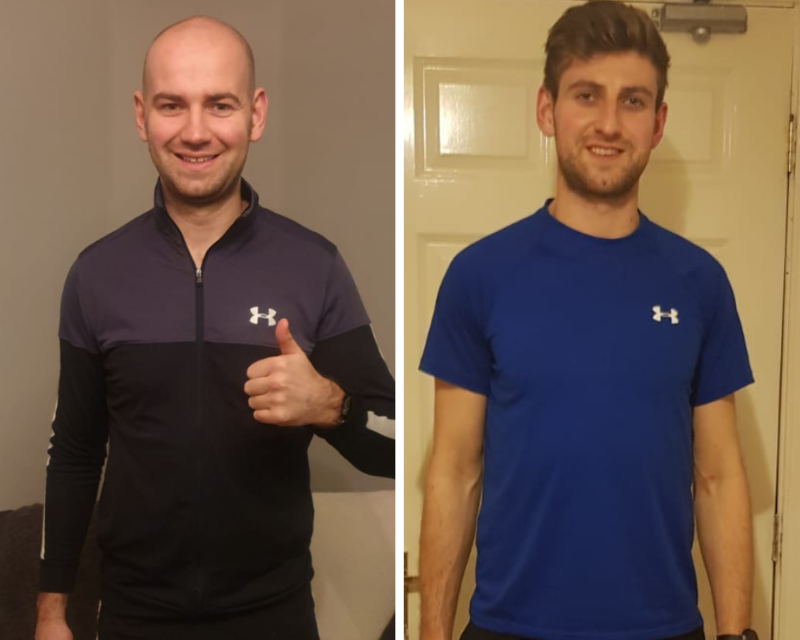 The determined pair are regular five-a-side players but have had to drastically step up their exertions in preparation for the 26-mile endurance run in the UK capital. They have already raised almost £1700 for their chosen charity beneficiaries, which include St Margaret of Scotland Hospice. Scott, 29, told us about why they are taking part in the event. He said: “Our Aunt Elissa spent her last few months in the Hospice and received invaluable care in the final stages of her life. Our family will always be indebted for that reason. 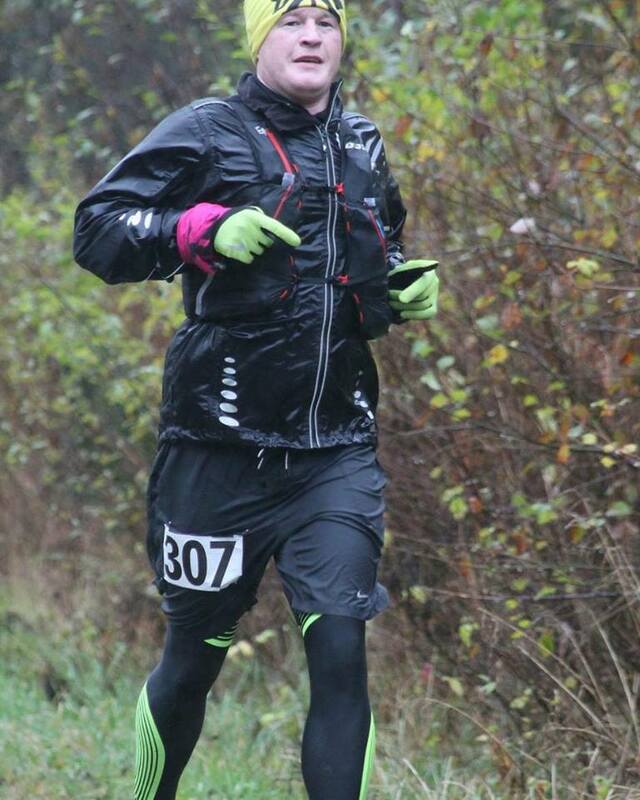 “Grant was fortunate to win a place in the open ballot for the marathon. It felt opportune for me to take a ballot place through work. Describing their training, Scott, who works for Clydesdale Bank, said the brothers knew they were taking a huge step. But both he and Grant, a 31-year-old joiner, are happy the hard work is literally paying off in the form of sponsorship, and expect to feel even more gratified come the end of the run. Scott said: “It is rewarding to see the fundraising amount go up, and does continually motivate us to put the mileage in. “Hopefully the day itself is rewarding and can be looked back on as a proud achievement. “We’ve not quite started from zero fitness as we play football regularly, but pre-Christmas the furthest either of us had ran before was 10k – a quarter of what we’ll do on the day itself. “Training is going well and times are looking optimistic but absolutely the hardest part is the knocks and pains on your body. To say it’s tough going would be an understatement. And the least? “The preceding 26 miles,” he added. Alison McGlinchey is taking part in the Glasgow Kiltwalk as part of the group Norrie’s Angels. The group are raising funds in memory of Alison’s dad, who was cared for at the Hospice. The Kitwalk takes place a year to the weekend since his passing. We spoke to Alison, from Clydebank, about why she and her co-walkers chose to take part in the event on 28 April. The 50-year-old, a quality control team leader for Arnold Clark, said: “My dad was the centre of our family and it was such a heavy loss. “Last year I contacted the Hospice for help when my dad was advised to seek palliative care, after battling cancer for five years. Looking after him was getting too difficult for my mum. “They stepped in and helped me when others wouldn’t. My dad spent his last two weeks in the Hospice and when he passed away, they helped my whole family deal with the most difficult day in our lives. “I want to thank the Hospice for all their support last year – they were so comforting when I was in tears trying to get support for my dad and mum. Alison knows the Kiltwalk is a tough task and has been training three times a week in preparation. But she also knows there is plenty to savour about taking part. She added: “I’m looking forward to the atmosphere on the day and the feeling of achievement. “I know my legs will be sore in the morning. I haven’t done anything like this recently and last did the Women’s 10k in 2008. “I wanted to do it last year but had to pull out. It looks like a fun day. When Catherine Macnaughton runs the Prague Marathon in May, it won’t be her maiden attempt at the ultimate endurance challenge. It will, though, be the first time she has taken it on in memory of her beloved mum, Heather. 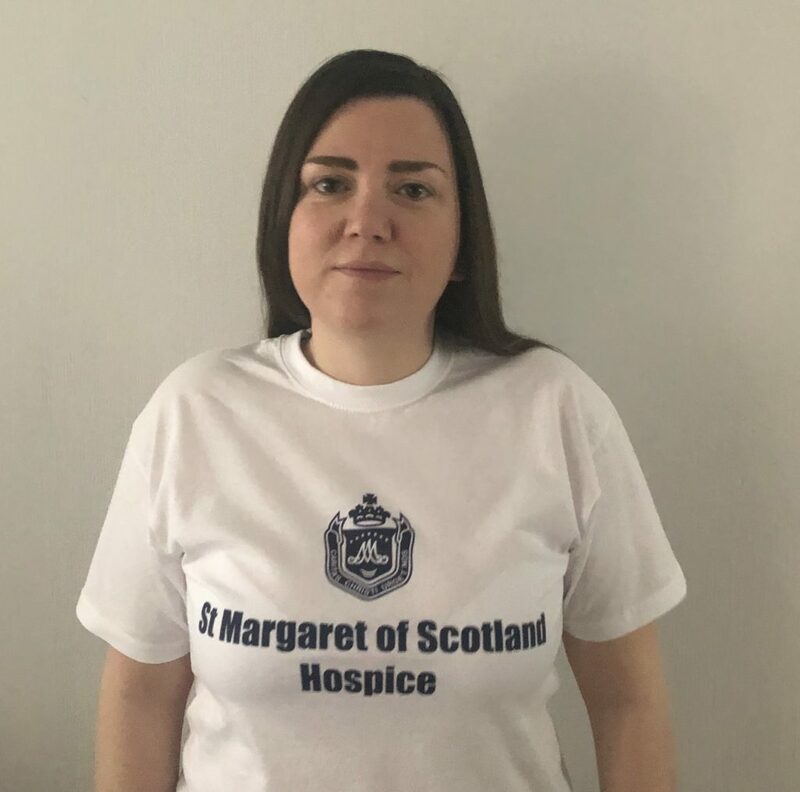 Catherine has raised money for several charities on previous runs but this time she will be gathering funds for St Margaret of Scotland Hospice, where Heather spent her final days between May and July last year. She had been diagnosed with stage four stomach cancer in November 2016. 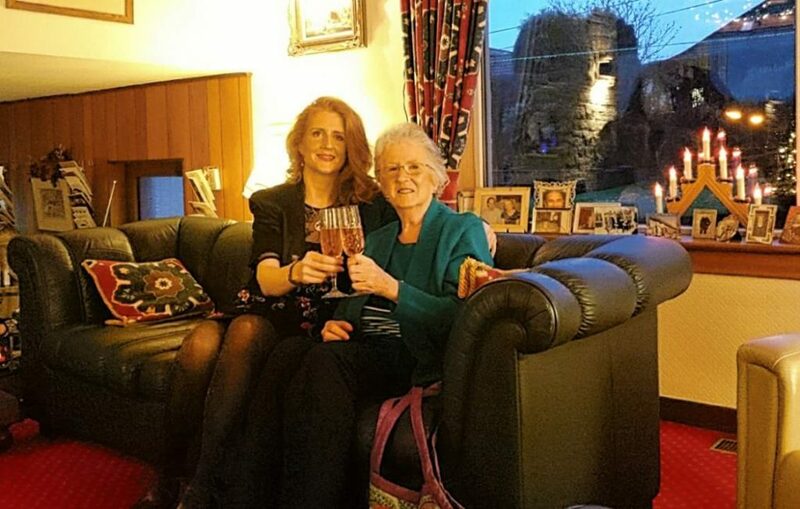 Catherine, from Anniesland, recalled when doctors advised the family it was time to seek palliative care for her mum. She said: “People told me St Margaret of Scotland Hospice was the first hospice in Scotland, that it was fantastic and that Mum would be in safe hands. Catherine, 42, found her first impressions held true after Heather had been admitted. She added: “Every single person I spoke to – the lady giving out tea and coffee, the staff in the restaurant, the gardeners – they were fantastic. “The nurses are so gentle and encouraging. The physios took mum to the sensory room and she enjoyed that. “In the gardens, it’s so restful and peaceful, and the roses and other flowers are beautiful. “Sister Rita came to speak to Mum, along with Sister Kate – they were very nice and very helpful. “Everyone was great. They put patients and families first and did everything they could to keep us comfortable. When we needed our spirits raised, they would always have a joke or something to make us feel better. The standard of care shown would not have been lost on Heather, who was 72 when she passed and had spent her working life as a radiographer with “a lovely manner” around people. Catherine explained: “Mum knew what it was like to care for people. She worked in the Western Hospital in the mid-to-late 70s. Choosing Prague as the place for pay tribute to her mum – her seventh marathon in total, with another to come in Berlin later this year – was an easy decision for Catherine. 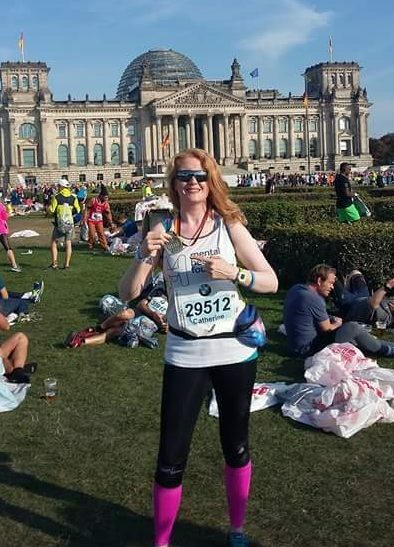 As well as being inspired to raise funds for the Hospice, she also had deeply personal reasons for adding to a bulging bucket list that includes two marathons in Edinburgh, three in Berlin and her first, in London, which she completed three years ago. Catherine said: “I thought Prague was somewhere Mum would love to go. She was from London and she came with me when I ran the marathon there – she was so proud. Looking ahead to the big day, 5 May, Catherine has several goals in mind – and some strategies to keep focused on them as the pain starts to build. She added: “I’ll keep thinking of something positive – what I’m going to enjoy or have as a treat when I finish, a warm bath, reading a book. “I think the atmosphere is going to be amazing – getting to the start line and seeing everyone around you. Seeing all the buildings and architecture. 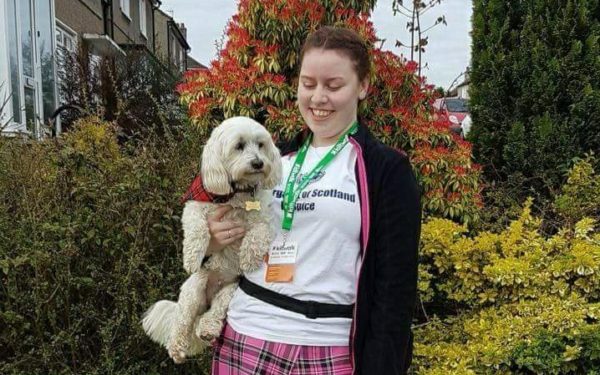 Emma Workman is taking part in the Glasgow Kiltwalk again this year to raise funds for St Margaret of Scotland Hospice. Emma, 24, from Bearsden, completed both the Glasgow and Aberdeen Kiltwalks last year – a total of 46 miles – collecting a fantastic sum for the Hospice. Here, she tells us what it’s like to prepare for the event and what she’s looking forward to most about it. Emma said: “I really enjoyed walking/training beforehand and the support from friends and family before, after and during the event was incredible. Like so many of our fundraisers, Emma’s connection to the Hospice is very personal. She admits that preparing for such a long walk is difficult and that the “cold weather isn’t the most motivational” for training – but is determined to help other families who are in need through her fundraising efforts. Emma said: “In late 2015 my Gran, Ethel MacAlister, was admitted to the Hospice for her final days. My Gran received loving care and dedication from everyone who came into contact with her and my family over these days. As an official charity partner of the Kiltwalk, any funds raised for the Hospice will be topped up by an ADDITIONAL 40% from the Hunter Foundation. Why not go to www.thekiltwalk.co.uk to see for yourself? During registration, when you are asked “Which charity are you fundraising for?” please select “Choose your own charity or cause” and type “St Margaret of Scotland Hospice” into the search bar. Or, for more information, you can call us on 0141 435 7018. Walk, run or cycle to raise funds for the Hospice – dates for your diary! 28 April – Glasgow Kiltwalk. Three distance options available: 23 miles, 15 miles and six miles. 9, 16 & 26 May – Babcock 10k series. Three 10k runs, one each in Helensburgh, Dumbarton and Glasgow. Can run separately or all three. 25 & 26 May – Edinburgh Marathon Festival. Marathon, half marathon and 10k events. 2 June – Aberdeen Kiltwalk. There is a choice of three distances: 23 miles, 15 miles and six miles. The Hospice is an official affiliated charity of the Kiltwalk, meaning your donations will be topped up 40% by organisers. June – Great Women’s Run 10k in Glasgow. The date for this event is still to be finalised. We will update as soon as we have a day! 18 August – Dundee Kiltwalk. See above for distances and details. 8 September – Pedal for Scotland Glasgow to Edinburgh cycle ride. 15 September – Edinburgh Kiltwalk. See above for distances and details. We hope these are helpful. Any and all efforts you go to in raising funds for the Hospice are hugely appreciated! Please get in touch if we can publicise your efforts or fundraising. You can call us on 0141 952 1141. You can also download our fundraising pack, which outlines the ways you can help and how to go about it, here.